Bishop Alan McGuckian SJ at Building Community Together in Belfast. A bishop from Northern Ireland has blamed the current political stalemate in Northern Ireland on indifference. Bishop Alan McGuckian SJ, originally from Antrim, made his comments just before a series of events marked the 20th anniversary of the signing of the Good Friday Agreement yesterday. “The reason why we are still stuck in Northern Ireland is that in our two communities or in our various communities we are happy enough the way we are and we couldn’t be bothered,” Bishop Alan McGuckian SJ told CatholicIreland. 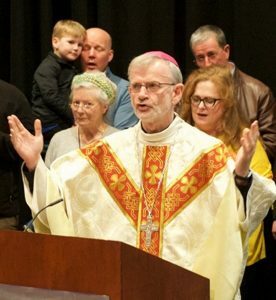 In Northern Ireland we are aware of the terrible wounds that live on in so many people’s hearts because of what they have suffered and continue to suffer as a result of the Troubles, said the Bishop of Raphoe, “but there’s another wound in us, a wound on the face of the Church, of us Christians” – and that wound is indifference. Bishop Trevor Williams with Bishop Alan McGuckian SJ at Building Community Together. 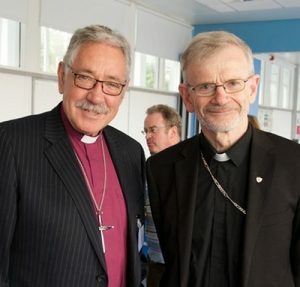 Bishop McGuckian joined 170 Christians from several denominations, including Church of Ireland Bishop Trevor Williams, at the all-Ireland Focolare weekend on ‘Building Community Together’. Former BBC security correspondent Brian Rowan, author of Unfinished Peace, gave the keynote address on Saturday. Asked by CatholicIreland if there was any possibility of the collapse of the Good Friday agreement and a return to violence, Mr Rowan said he believed the war was over. “I am pretty convinced about that.” The dissident organisations that emerged just before the Good Friday agreement in 1998 had not been able to “recreate the conflict” because there was not “the community support or community tolerance, not the wherewithal that would allow such a repeat of the conflict period”. He considered whether that meant we are not in danger of someone being killed tomorrow or the next day, answering that we haven’t got to that point. “I think the next phase of our politics is going to be a kind of tug-of-war between union and unity and here we are arriving at the Good Friday anniversary and the political institutions that are at the heart of it are no longer there. And we are in danger of them not being restored,” he said. Given how the huge hurdles of the ceasefire and arms decommissioning were overcome, Mr Rowan said if issues like the Irish language, marriage equality and a Bill of Rights could not be resolved, we don’t deserve a Stormont.